Teachers picketing at Bethune Middle School on first day of LAUSD strike, Monday January 14, 2019. As we enter day two of the teachers' strike in Los Angeles, we get the latest details on negotiations between L.A. Unified and the teachers' union. Plus, we get a history of strikes in L.A. and how their ripple effects continue to affect the city. And, we check in with one of our reporters on her attempts to go plastic free. 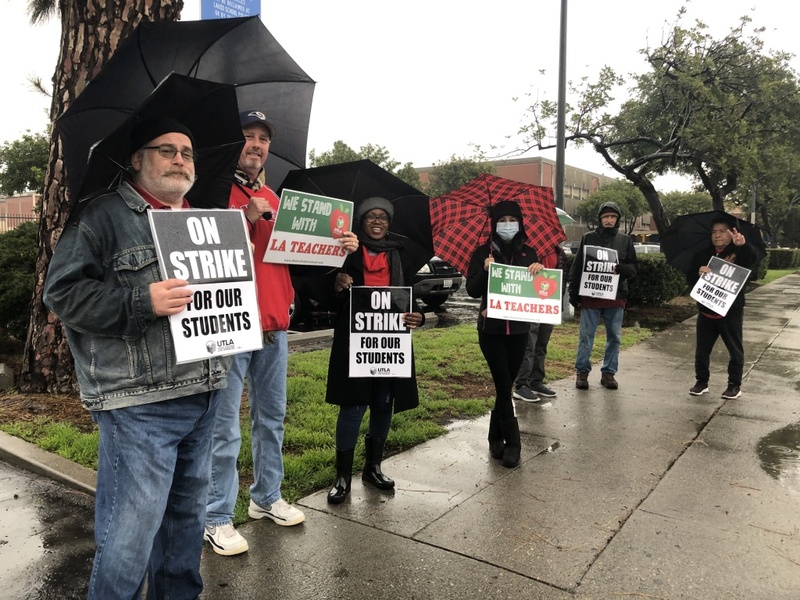 We bring you the latest details on strike negotiations between the Los Angeles Unified School District and United Teachers Los Angeles. A series of SoCal storms will continue to drench us all week. As a result of yesterday's rains, evacuation orders are in place for parts of Malibu that burned during November's Woolsey Fire. Also in parts of Riverside County that burned during last April's Holy Fire. We get an update. A federal judge in New York has ruled against a Trump administration effort to add a question about American citizenship to the 2020 census. The Commerce Department - which oversees the census bureau - pushed for the question despite a recommendation against it by the Bureau itself. A coalition of advocacy groups argued the move would give Republicans a political upper hand. On Tuesday, in a scathing ruling, Judge Jesse Furman said the commerce secretary committed a "smorgasbord" of federal violations in ordering the question. Voters were asked back in November to approve tighter rent-control regulations. They said no to that ballot measure. This has prompted discussion about other ways to stabilize the amounts that tenants pay for their rentals in California. As part of our coverage of the California Dream, KPBS's Amita Sharma says some mayors want state lawmakers to approve anti-price-gouging rules to slow the rate of rent increases. The history of strikes in L.A. The current teachers' strike in Los Angeles isn't the first to hit the city. Over the years, hotel workers, garment workers, janitors and other laborers have protested for better pay and working conditions. We bring you the history of major strikes in L.A., and their lingering ripple effects. Erik Loomis, labor historian at the University of Rhode Island and author of "The History of America in Ten Strikes"
Hundreds of Los Angeles school teachers attend a strike rally this afternoon at Griffith Park. Photograph dated February 5, 1987. A four-year-old boy in Riverside died from the flu over the weekend, bringing the total number of flu deaths in California to 52 this season. The flu is especially dangerous to children and pregnant women, according to the Centers for Disease Control, which continues to urge people to get their flu shots if they haven't already done so. Flu season typically runs from October through May, but it peaks in February. Take Two is moving to a new time! We have big news for you: Starting Tuesday, January 22 you can hear Take Two at 2 pm every weekday. This makes sure KPCC listeners get our signature local, public affairs shows – Airtalk and Take Two — in the morning and afternoon. And what’s happening with 9 am? We’re adding a new show. It’s The Takeaway with Tanzina Vega with an in-depth look at national and international news and issues. The Takeaway, weekday mornings at 9, and Take Two at 2 pm! 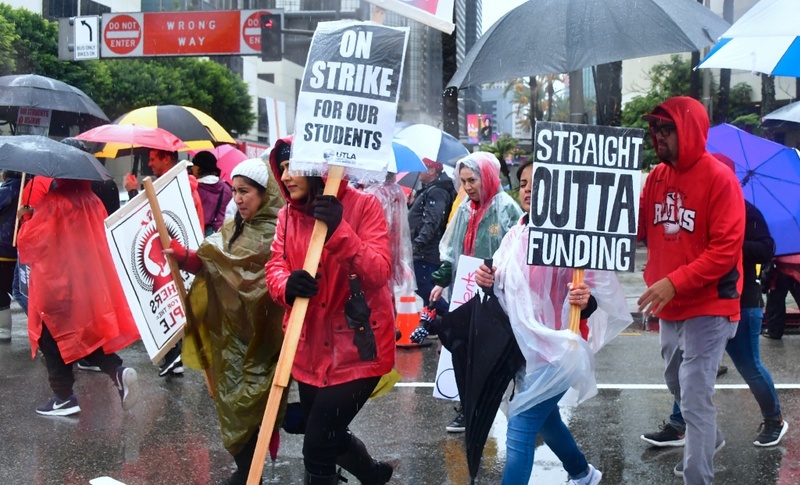 What's really at stake in the LA teacher's strike? Teachers in the Los Angeles Unified School District continue to strike outside their respective schools today. Negotiations between the district and the union representing educators - United Teachers Los Angeles - are deadlocked and it is unclear when the two sides will return to the negotiating table. However, the fight over funding that has to lead to this current conflict has been decades in the making all across the state and there's a lot at stake. Click here for Miriam's op-ed.